The most unlikeist of popular girl bands, the anthakshari singing and dancing acapella all girl group Barton Bellas is back again. Pitch Perfect 3 is a 2017 American musical comedy film directed by Trish Sie and written by Kay Cannon and Mike White. 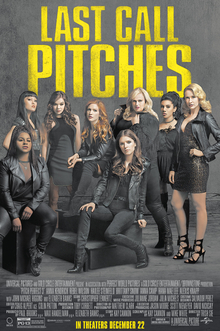 A sequel to Pitch Perfect 2 (2015), and the third installment in the Pitch Perfect series, the film stars Anna Kendrick, Anna Camp, Rebel Wilson, Brittany Snow, Hailee Steinfeld, Hana Mae Lee, Ester Dean, Chrissie Fit, Alexis Knapp, John Lithgow, Matt Lanter, Ruby Rose, Kelley Jakle, Shelley Regner, Elizabeth Banks, and John Michael Higgins. The film follows the Bellas, now graduated from college, reuniting for one final performance together during an overseas USO tour. While the songs aren’t mostly what I like and the acapella stuff is not exactly my cup of tea, I mostly watch this franchise for Anna Kendrick, Anna Camp & Brittany Snow. But this movie franchise is getting to the point of not being much interesting. Three years after the Bellas have graduated they are in a rut and would love to sing again. Beca, Fat Amy, Chloe, Aubrey, Lilly, Stacie, Cynthia Rose, Florencia, Jessica and Ashley are all thrilled to learn that Emily, now a senior at Barden and leader of the Barden Bellas, has seemingly asked for the Bellas to reunite at an event in New York Aquarium to sing with each other once more. However, once the reach there Emily is sorry as it was only to see her and the new Bellas sing. Later at a bar Emily apologizes but the Bellas just want to be together and sing again so Aubrey convinces them to join a USO performance accessed by her Army officer father. If they win the competition, they get to open for DJ Khaled. The Bellas gladly accept, all except for Stacie who is eight months pregnant at the moment and is unable to go with them. They face stuff competition from three bands who actually play some instruments and they are belittled. They perform in the Spain but things go wrong at their first event but they try and work it out though at a party in DJ Khaled’s suite and accidentally set a fire. Beca hits it off with Khaled’s music producer Theo and records a loop that impresses him and later on Khaled. Anyways, Amy’s criminal dad catches up to her and wants to reconnect but his sincerity turns out to be false and that he has not seen her perform at all, while confessing that he is only trying to acquire an offshore account Amy’s mother set up which contains US$180 million. Beca is offered a solo spot with Khaled but she doesn’t want to leave her group. The remaining Bellas are taken away by a Frenchman in a dark grey van out onto a yacht in a nearby harbor and held at gunpoint by Fergus, Amy’s dad, so Beca & Amy sneak into the yatch and Beca distracts Fergus by having the Bellas perform “Toxic” for him and two of his men, just as Amy sets the yacht to explode. The Bellas escape the yacht just before it blows. Fergus survives the explosion and is arrested for his crimes. After the Bellas are rescued by the military, Fat Amy reveals DJ Khaled’s proposition to Beca to the others. They encourage her to take the chance, and they all agree that now it’s time to move on with their lives, with Amy using her bank account for multiple tributes to singers named Amy, Aubrey trying to be a birthing coach, Flo’s juice cart becoming part of an international brand, Chloe getting accepted into vet school, Cynthia-Rose staying at the base to get into flight school, Emily going back to Barden to prepare for her upcoming abnormal psychology test while continuing her songwriting, and Lilly revealing that the reason she was quiet was because she was possessed by Satan and the yacht incident snapped her out of it, and that her real name is Esther. They know very well they’ll be separated, but still be connected to each other as a family. Later at the USO’s final performance, Beca opens for DJ Khaled and sings on stage, and afterwards brings up the Bellas onstage for the girls to sing their final performance with the other competitors gladly watching the Bellas sing “Freedom! ’90” to their hearts’ content. A series of mid credit scenes reveal the Bellas’ separate story arcs closed out to their mostly happy endings, with Lilly hanging around with DJ Dragon Nutz, whom she flirted with earlier, Aubrey reconnects with her father and Chloe and Chicago kiss, witnessed by a grimaced looking Beca, who is now the boss of Theo. A 6.5 outta 10 at the end for me. It’s so cliched that it spoils the movie a lot but it does have some fun moments. 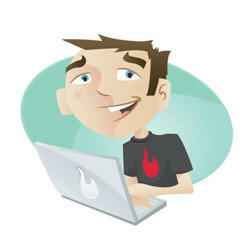 Still, not very interesting.